These products are on sale! 82 Items. Showing Items 61 thru 75. .25 carat diamond solitaire Keepsake engagement ring. An unusual bi-pass designed ring with a .18 carat Old Eaurpean cut diamond set in a heart shaped setting accented with synthetic sapphires. The ring estimated to be approx. 30 years old with a 1900's diamond. 5.0mm .60 carat sky blue topaz. Setting is made from the original mold circa. early 1900's. 17x13mm shell cameo. Setting is made from the original mold from early 1900's. 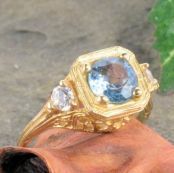 Featuring a 6.0mm .75 carat aquamarine with two .10 carat diamonds with a total gem weight of .95 carats. Manufactured using a mold of the original antique hand carved die. 19k rose gold holloware bow shaped brooch of European origin. A 6.8mm Japanese Akoya white cultured pearl with (2) diamonds are approx. .10 carat round brilliant cut. Cameo measures 14 x 9.5 mm and is carved from 2 layers of banded black and white onyx. Circa 1910's sterling silver guilloche and cloisonne enamel Canadian Provinces crest pin. White enamel background with tiny blue forget me not flowers on brass. Measures 4.0mm in width. Having 11) approx. .045 carat round brilliant cut diamonds VVS clarity, G in color all channel set. A large brooch of a chrysanthemum flower framed by foliage and budding chrysanthemums. Circa 1860's. 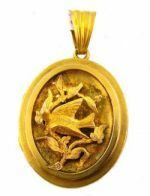 Solid 14k with hand formed 3 dimensional applied swallow bird design. Having a .10 carat European cut diamond, a .08 carat transitional cut diamond with sapphire and diamond accents.